The Thompson Tide: What's Up at the Masters Today? 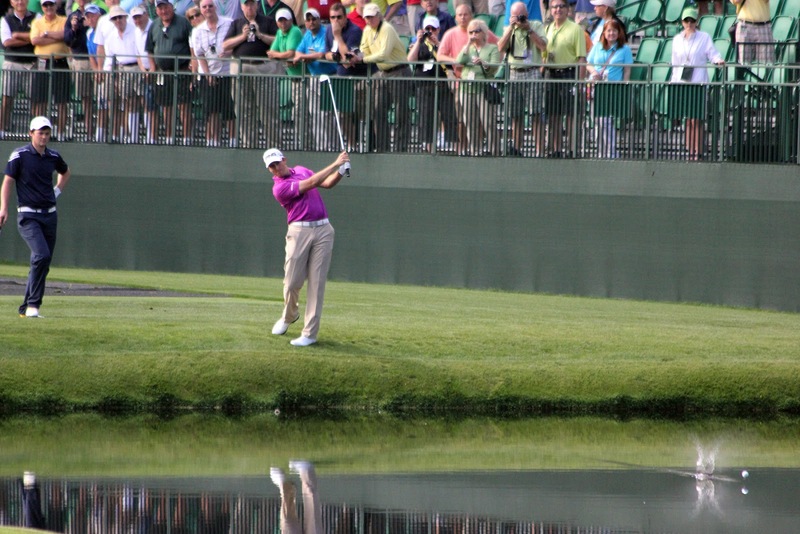 During Michael Thompson's practice round on Monday he tried his hand at skipping the pond at the 16th hole. Photo by Mike Holmes. As Masters Week continues, Michael Thompson got some good press from a couple of sources on Tuesday. First, Michael's day got started early at the Augusta Golf Breakfast where he was the featured speaker. Based on all early reports the breakfast went great. Second, as he promised after the Shell Houston Open, Jason Sobel wrote a nice article on Michael and his previous Masters experience. It is a great article and well worth the read. On the golf course, Michael got in some practice with Kevin Streelman and Jerry Pate as they played the front nine together on Tuesday. Tee times have been announced and Michael will be paired with John Sendon and John Huh. The trio tees off at 10:12am ET. All golfers start from the first tee. Wednesday features another Masters tradition: the par 3 contest. The event will streamed live from 3pm ET from the Masters website: Masters Live Streams. It will also be aired live on ESPN from 3-5pm ET.